Treat yourself to the break you deserve... visit our paradise! From the moment you enter Castaways Holiday Resort, set in tranquil surroundings, you will begin to relax and unwind. 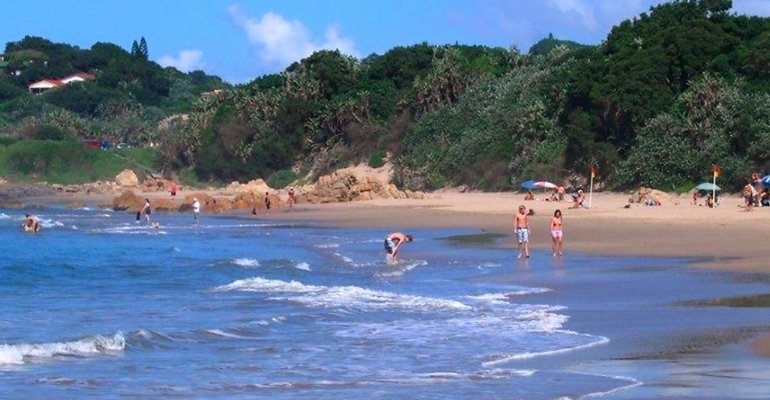 Castaways boasts magnificent shaded sites for tents or caravans with electricity and spotless ablution facilities. Alternatively, book into one of our fully equipped chalets, which accommodates up to six people comfortably. All the self catering units have television. Castaways boasts a large recreation hall with licensed bar, tuck shop, ice machine, coin operated Laundromat, pool tables, darts, table tennis, etc. for hours of fun. The recreation hall is also available for conferences on request. A sparkling fresh water swimming pool and kiddies paddling pool are also a great form of recreation at Castaways. The playground with it's popular trampoline provides hours of entertainment for the younger holiday makers. Glenmore Beach is a popular spot to spend your days in the blissful sun - especially if you have children, as this beach has shark nets. There are also lifesavers on duty during season. To get to this beach from Castaways you simply amble 400m ahead without having to cross any roads. The ski boat club is also on this beach. For the golf enthusiast, this area has a wealth of beautiful golf courses... San Lameer, Southbroom and the Wild Coast Casino is only to mention a few. These courses are all only minutes away from the park. The bright lights and magic of the Wild Coast Casino is only 11km away. Other attractions include the Riverbend Croc Farm, Mpenjati Game Reserve and Umtamvuna Nature Reserve. This destination is comfortable accommodation for the whole family!